If you are stressed, overweight, have problem skin, suffer from aches and pains or simply want to detox. Energise the body and relax the mind. When using the detox box you will notice a great sense of relaxing and revitalisation as your body releases endorphins into your system. Endorphins or "Happy Hormones" are often referred to as the "runner's high" and several researchers have linked it to enhancing the immune system, relieving pain, reducing stress and the aging process. Studies show that the gentle infrared rays support the energy of the body's cells. This can, in turn, improve the look and function of the skin. Like the rest of the body, skin needs a constant, fully adequate supply of energy to heal damaged DNA, regulate the production of collagen and elastic to give birth to new cells and eliminate waste. These are some of the most important processes on which beauty depends. Detox sauna weight loss includes luxury Swedish Manage treatment, plus showers. 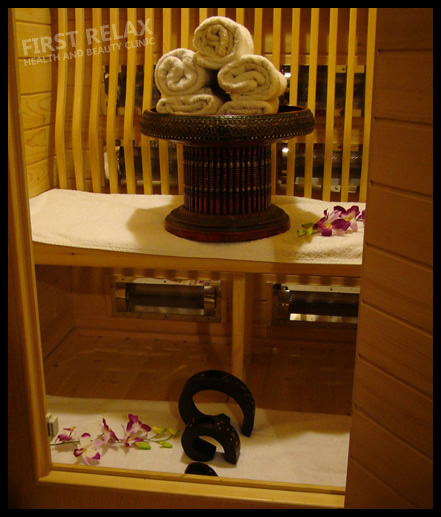 Includes 60mins full body Swedish massage or Aromatherapy massage and a 30min sauna, a total of 90 mins.